Last year I wrote a post titled Rabbitware For Easter. 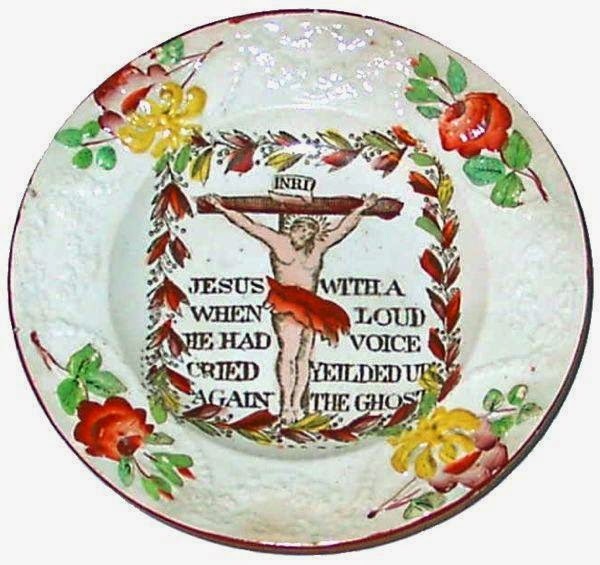 This year I shall show you a child's plate with a scene from the Crucifixion of Christ. Patterns made for children were often intended as gifts which could also be used as teaching tools. This plate may have been an Easter gift. It was made by Baker, Bevans & Irwin (1814-1838) in Swansea, Wales around 1830. The text, which is from Matthew 27:50, reads: Jesus When He Had Cried Again With A Loud Voice Yeilded (sic) Up The Ghost (spirit). INRI at the top of the cross stands for Iesus Nazarenus Rex Iudaeorum or Jesus Of Nazareth, King Of The Jews.